Students walk around piles of cardboard boxes, blankets and a tent on the sidewalk on their way to the subway. Others, leaving the Tim Hortons on Victoria Street avoid eye contact as they mumble and nod thanks to Jason Serroul for holding the door. The occasional passerby hands Serroul some quarters. Sometimes it’s a coffee. Sometimes a takeout container with leftover food. Located in the downtown core, Ryerson University has long been a hub for people experiencing homelessness. 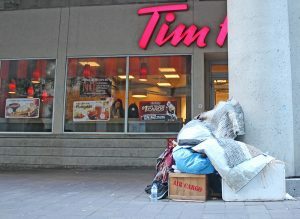 When the city evicted several homeless individuals from the Victoria Street Tim Hortons on Sept. 20, it took less than 24 hours for some to resettle on the sheltered sidewalk, steps from the franchise’s doors. Ryerson’s president Mohamed Lachemi said the Social Venture Zone, O’Keefe Lane Revitalization and other ongoing fundraising initiatives are part of the university’s response to homelessness. But many say there’s much more work to be done. Scott Dudman, a friend of Serroul’s who has previously been homeless and still panhandles on occasion, said Ryerson could help by compiling and regularly distributing lists of shelters and housing resources. “Maybe some of the rowdier students could take it easy on some of us guys,” he added. He said that Ryerson does a lot for the homeless community when it comes to providing clothing, blankets and food — especially during the winter months. “The community needs to work with people, like Ryerson (does),” he said. “That way in the long run, we can help ourselves. Coun. Kristyn Wong-Tam, who represents the ward that includes Ryerson, said the university is “at the table” in the discussions on these issues but that its efforts could improve by creating an outreach team. Wong-Tam said she has heard from those experiencing homelessness that they sometimes aren’t aware of available services. She said others may refuse help because of mental health issues and an unfamiliarity and mistrust of outreach team members. An outreach team at Ryerson, whether student- or faculty-led, could help the city and other teams to educate those without homes about housing resources, said Wong-Tam. While many, like Wong-Tam, said Ryerson could improve the situation by getting more involved on the ground, the university’s community members and neighbours are pointing fingers at the system they say continuously fails the city’s homeless people. “I think it’s appropriate that this is so ‘in our face’ because it points to a failure — a failure on behalf of our community to appropriately address this,” said Ryerson instructor, Pascal Murphy. The unaffordable housing crisis isn’t helping either, added Murphy, who teaches courses on homelessness and social justice. “Unless there’s a space where people can ‘be’ — an appropriate space, a healthy space and safe space, an affordable space — then all we are doing is being bullies,” he said. 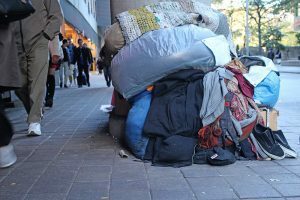 The Ryerson instructor said homelessness is far beyond what is seen on campus; it’s a problem that extends further than a few individuals who panhandle or sleep on the streets. He said the university, students and faculty have a responsibility when it comes to advocating for an appropriate solution. Murphy adds that this failure is solvable — if we have the political will to do it. “Why don’t we look at the broader system that’s creating this as opposed to just these individuals,” Murphy asked. Wong-Tam said homelessness wouldn’t exist in Toronto if the city’s services, which include affordable housing and mental health, were accessible to people. “It’s actually a scar on the city because it speaks to the fact that there’s a system fail between what the province and the federal government and the city are supposed to do,” said Wong-Tam, whose ward, Toronto Centre-Rosedale ward, has many homeless. A block east of Ryerson, clusters of homeless people linger on George Street outside of Toronto’s largest men’s shelter. The Seaton House redevelopment was approved in 2013 as part of the city’s George Street Revitalization plan. Scott Callender, the program co-ordinator at Seaton House, said anyone can walk off the street right now and check into one of the shelter’s 539 beds, space permitted. On Oct. 16, when temperatures dropped to a low of 4 C, the shelter was at full capacity. “Everybody needs a home,” Callender said. Seaton House practises a housing-first model. This means that once someone enters into their emergency shelter facilities, they stabilize the individual with care including doctor visits or medication, and then help them find transitional housing and surround them with appropriate services. Callender has worked at Seaton House for 20 years and said the housing-first approach is a systemic change that’s working, but shelters just aren’t getting enough resources from different levels of government. “I think one of the ways (Ryerson) can help is putting a spotlight on the fact that there’s a shortage in housing, there’s a shortage on a certain type of housing and there’s a problem with affordability,” he said. Murphy said research has actually shown the housing-first approach is more affordable for a community and that maintaining the homelessness crisis is more expensive than solving it. As of Oct. 23, city shelters are all nearly at full capacity. The lowest was 97 per cent. Back on campus, engineering students are working on an initiative to brainstorm ways the university and community members can come together to tackle homelessness. Ryerson’s chapter of Engineers Without Borders (EWB) launched TOgether in June 2017. “As engineers, we build… not so much just building physical structures, but building systems that can enable people to prosper,” said Amadeus Commisso, the co-president of EWB. Fahim Khan, lead for TOgether at Ryerson, said it’s important to start a dialogue on homelessness, affordable housing and development issues to build long term, sustainable solutions. And that’s what TOgether is trying to do, alongside smaller campus fundraisers and city-wide outreach. They’re preparing a month-long campaign of case competitions, a hackathon for homelessness solutions and a charity dinner for next winter. “Collaboration is the key no matter who you are, and which academic background you are from, if your goal is to come up with a permanent solution to a problem like housing,” Khan said. A big player addressing this is Toronto Public Health, the city-run organization across the street from Tim Hortons. Dudman said there are a lot of people in the Tim Hortons vicinity, especially now that the Works Needle Exchange Program is active. Shaun Hopkins, Toronto Public Health spokesperson, said if clients express an interest, they maintain a relationship with program participants and support their well-being once they leave the building, including referrals for housing services. A number of their clients are either homeless or underhoused, said Hopkins, who’s also the program manager. “If needed, we will co-ordinate with Shelter, Support and Housing Administration on a case-by-case basis,” he said. Khan, Ryerson’s TOgether lead, said he sees the need for assessing homelessness beyond cases of addiction and negative stigmas like laziness. He said that homeless individuals are missing the kind of atmosphere that allows others a more complete path to personal development. “What we want to make people believe is that it is an important issue that needs your consideration and needs your thoughts and effort,” Khan said. Homelessness in the downtown core isn’t a Ryerson issue or a Ward 27 issue, Wong-Tam said. In between a shift panhandling outside Tim Hortons, Dudman said he’s thankful for all the help Ryerson’s given him. He said that without Ryerson’s efforts, the homeless community would suffer a lot more. What’s stalling Go Transit Wi-Fi?